Abbie Cornish from Bright Star. I'd never seen any of her work until I saw the new Jane Campion movie at TIFF. Cornish plays Fanny Brawne, a fashionista who falls into a feverish romance with poet John Keats, played by Ben Whishaw, whom I last saw playing Hamlet at the Old Vic in London in 2004. Campion is underrated as a visual stylist, and the beauty of the shots in this movie convince us that they could have inspired Keats' poetry. Campion does not blow the romance out of proportion. We do not see the moments on screen literally inspiring specific words in his poems, and though we know Keats is to become one of the world's great Romantic poets, he seems no different than many a fervent young lover. Cornish's portrayal of Brawne feels both controlled and yet completely free and uninhibited, a quality I see in so many of my favorite performances. She has a very good chance at a best actress nomination. 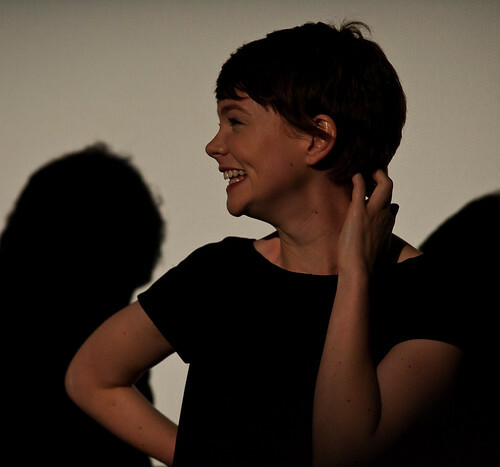 Another young actress who will announce her presence in a memorable fashion this fall, is Carey Mulligan. She is the star of Lone Scherfig's An Education which opens in LA and NY today. My sister Karen and I caught a morning screening at TIFF. Mulligan plays a 17 year old overachiever in her last year of high school, on the cusp of applying to Oxford where her father has always dreamed she'd go. But a chance encounter brings an older man (Peter Sarsgaard) into her life, bringing with him the fun and excitement of fine dining, jazz clubs, travel abroad, and access to the world beyond books and studies. The movie is based on a memoir written as a look back on an affair at an earlier stage of life. One can imagine the voice of the older self dissecting transgressions of youth with a critical, chiding tone, but played by Mulligan, the movie has a sweetness at its heart. Mulligan is charming and cute as a button, and she doesn't just recall the look of a young Audrey Hepburn in scenes set in Paris but also the charisma. The role of the gamine, among others, is hers to own for years to come whether or not a best actress nomination comes at the next Oscars. And even if An Education doesn't break big, she has plenty of movies shooting or in post which will introduce her to a global audience. Among others, she'll be seen in 2010 in Wall Street 2 playing Gordon Gekko's daughter and love interest of Shia Labeouf, whom she's dating in real life.